This article first appeared in The Edge Malaysia Weekly, on January 4 - January 10, 2016. 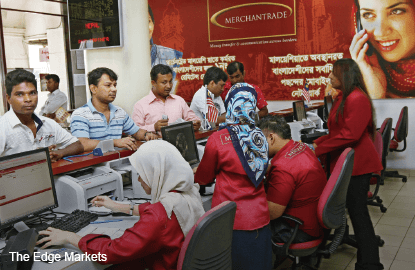 MERCHANTRADE Asia Sdn Bhd, the country’s first and largest non-bank remittance services provider, plans to raise about RM250 million in an initial public offering (IPO) that’s aimed for the latter part of 2016, sources say. “It’s likely to be in the fourth quarter of 2016. It will be a Main Market listing [on Bursa Malaysia],” one of the sources tells The Edge. It is understood that at least four investment banks have pitched to handle the IPO. Talk is that Maybank Investment Bank is the frontrunner for the job. Merchantrade will be the first money services business (MSB) company focusing on outbound and digital remittance to be listed in Asia. The home-grown company is backed by strong shareholders that include Celcom Axiata Bhd (20%) and Japan-based Sumitomo Corp (16%). Founder and managing director Ramasamy K Veeran is the single largest shareholder with a stake of about 29%. “The IPO gives investors the opportunity to look at alternative financial counters. Merchantrade has steady growth in fee-based income and high growth from its MSB as well as payment space,” the source says. The RM250 million raised from the IPO will go towards funding Merchantrade’s expansion in Malaysia and abroad. In an interview with The Edge last month, Ramasamy said the company was seriously considering a listing as part of its next phase of growth, which would also include an expansion into Asia-Pacific. He said an upward trend in outbound remittance flows since 2011, driven by foreign workers and expatriates sending money back to their home countries, is likely to continue over the next few years, compelling Merchantrade to grow faster. The company provides remittance and money exchange services, and recently obtained conditional approval from Bank Negara Malaysia to go into the wholesale currency business. With that, Merchantrade is now involved in all aspects of MSB. Most of the outbound remittance it handles is to Indonesia and Bangladesh. In 2014, the company handled RM3.2 billion in outbound remittance, a 39% growth over that in 2013. Ramasamy expects the amount handled to grow by about 41% to RM4.5 billion in 2015. As an industry, MSB contribution to outbound remittance in Malaysia grew 24.1% to RM17.5 billion in 2014 and Ramasamy anticipates that it may grow by 42.9% to RM25 billion in 2015. Given the expected growth, foreign MSB players have been entering the Malaysian market, keeping Merchantrade on its toes. In June, Ria Money Transfer, the world’s third-largest money transfer company — a subsidiary of Nasdaq-listed Euronet Worldwide Inc — acquired IME (M)Sdn Bhd, Merchantrade’s closest competitor. And in November, it was reported that DiGi.Com Bhd’s Norwegian controlling shareholder, Telenor Group, had agreed to buy licensed MSB player Prabhu Money Transfer Sdn Bhd for an undisclosed sum, subject to Bank Negara’s approval. “When the global players are coming into the market, you need to raise your bar and you need to get well-capitalised and everything. So, we need to look at the direction we’re going. That’s one of the reasons why we’re thinking of listing,” Ramasamy told The Edge. He said Merchantrade expects to make some acquisitions in 2016 to stay competitive. He is looking for targets in Asia-Pacific countries, where there are a high concentration of foreign workers and hence, strong outbound remittance flows. For Merchantrade, growth in its remittance business will also come as it starts to focus on small businesses, instead of just individuals, and in tapping the digital space. The company is currently the biggest digital player in the MSB space. For example, a few years ago, it launched its e-remit portal, which is becoming popular with expatriates as it enables convenient online money transfers. This will be available as a smartphone app from January. Merchantrade also has its e-forex portal, which enables customers to do foreign exchange transactions online on a real-time basis. Apart from MSB, Merchantrade also operates a mobile virtual network — in partnership with Celcom (Axiata), it was the country’s first mobile virtual network operator (MVNO) back in 2007, offering prepaid mobile IDD and data services. But it is a highly competitive business that is proving to be a drag on the group’s overall earnings. While the bulk of its revenue comes from the MVNO business, it is the remittance business that is the biggest contributor to Merchantrade’s profitability. It made a net profit of RM37.61 million on revenue of RM588.76 million in 2014, an increase from RM26.1 million and RM438.15 million respectively in the previous year. Merchantrade has 69 of its own branches and 280 remittance agent locations nationwide, making it the largest player by number of locations. It employs some 700 people.